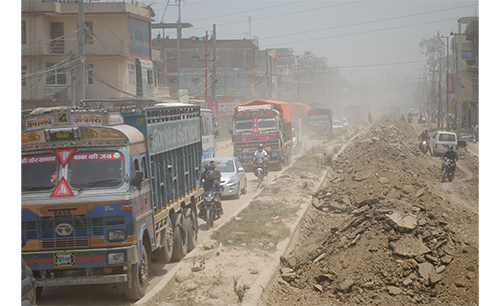 The widening of Tripureshwor-Kalanki-Nagdhunga road, a crucial section of strategic road networks (SRN) in Kathmandu Valley will start this fiscal year. The contractor selection process has reached the final stage, according to the Ministry of Physical Infrastructure and Transport (MoPIT). The section is being extended under two separate packages — Tripureshwor-Kalanki and Kalanki-Nagdhunga. As per the Kathmandu Valley Road Improvement Project (KVRIP), the Tripureshwor-Kalanki road is planned to be widened to six lanes (18 metres) from the existing four lanes, which is 12 metres wide and it will also have improved pavement for pedestrians, besides alignment dividing green belt in the middle of the road. Similarly, Kalanki-Nagdhunga section will be upgraded to four lanes from the seven-metre two lanes at present. “The construction of Tripureshwor-Kalanki-Nagdhunga road is projected to start within this year,” said Tulasi Prasad Sitaula, secretary of MoPIT. He added that work on clearing right-of-way (RoW) on both sides of the section will start within the next three months, as contractor selection work has reached the final stage.